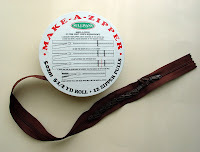 One of the most vital products in my sewing studio is "Make-A-Zipper". 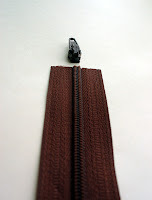 Economical and easy to use, I just measure the length of zipper I need and snip it off. One peril of using it, however, is over-zealously zipping the zipper pull off the zipper! After much forehead slapping and abandoning perfectly good zippers, I came up with the following way to rethread a zipper pull. Just pull the tapes apart - they should separate fairly easily. I usually make mine around 2 to 2 1/2 inches long. This is the important step. Carefully line up one side of the masking tape along the outside edges of the zipper teeth, making sure to leave about three-quarters of the tape hanging off the end. 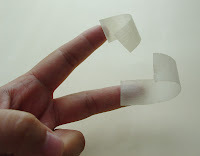 Then fold the masking tape back on itself to the other side of the zipper, creating a little tab. Now do the same to the other side of the zipper. Thread the zipper tape through one side of the zipper pull. You'll feel the teeth click as they enter the pull. I usually slide 2 or 3 teeth into the slide. The tab is helpful for this step. Tugging firmly but gently, thread 2 or 3 teeth through the other side of the pull. This is where you'll see the tabs in action. Firmly hold both tabs in one hand and pull on the zipper pull with the other. You may have to change the angle of your zipping hand slightly to get the pull to move. Try wiggling your hand around and soon you'll start feeling the zipper pull zipping. 7. Hurray! Your zipper is happily re-threaded! Now take a look at your re-threaded zipper. Your zipper tapes may be misaligned a little bit. If that's not a problem, then sew away! If this is a problem, start the process all over again. But you're a pro at this now, so it will only take a few seconds! 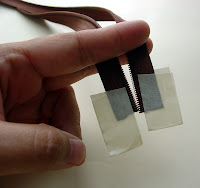 Note: I've only tried this method with nylon coil zippers. I'm not sure if it would work for zippers with molded plastic coils. 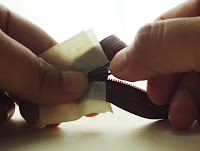 This technique also applies only to zippers without a zipper stop. Let me know if you have any questions or if this tutorial is helpful. I know I'm thrilled with my home-made niddy-noddy! Wow, such a great looking tutorial! I am inspired, I have been wanting to offer some myself. I zip off zipper pulls right and left! It is a "Oh--tell me I just didn't do that again!!" kind of moment. I just used this tutorial to re-thread a zip on the bottom cushion of an Ikea futon/couch. I had to rip out a couple of stitches, but it worked! Thank you! A BIG mahalo nui for sharing your knowledge. Just repaired a zipper on my son's soft guitar case. Had been struggling to start the zipper pull using small forceps. Your method took less than 5 minutes! I'm so glad this has been helpful! Glassbeach, thank you for sharing your insight of re-thread a zipper pull. I had on-line-purchased a 120” zipper tape and a zipper pull. My purchase did not come with instructions or instructions weren't available on their web site. I found glass-beach.blogspot most helpful. I struggled a bit on #6. Start zipping, then got two pliers. I used one plier gripping both left/right zipper tapes and the other pliers gripping the zipper pull, wow, which was easy. I’m on #7. Hurray! My zipper is happily threaded. Thank you. I'm so glad this was helpful. Your addition of the pliers is brilliant. I'm going to try that the next time I thread a zipper! Thank you for posting this! I just used your method- it took about 3 minutes in total and was super easy. You saved me a trip to the fabric store and the cost of new zipper. wow! I never knew we can make a zipper. I guess I never found anything like it yet here in malaysia hee but it would be great if we have it too! hooray! I just fixed my favorite purse, thanks! Thanks for a really helpful guide, the photos really help. I now have 1 perfectly fixed white sofa cushion that can now be washed instead of covered with a carefully placed throw. Sweet! I repaired the zipper on the dog bed and saved a fortune. Thanks for the post. Thanks I used another method last year that worked great however this year I was having loads of problem. This method worked great. My sewing is limited to buttons. Can't even iron. Good at geekstuff, writing, and home repairs. But even I could follow your easy instructions. You saved my favorite key case. Thanks! You are the best!!!! I thought it was hopeless after trying to jam it back on from the too, butbyour idea worked in two minutes. Yay!!! Since I just saw this on Pinterest today (congrats!) I wanted to say thanks for the masking tape tip! That's one I hadn't thought of; I use heavy thread but it's not so easy to control... I'm switching! 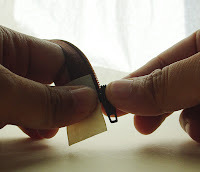 Also, to make the tab easier to pull, you can thread on one of those split keyrings for the task -- super easy to pull. I keep a spare with my sewing stuff just for this purpose. thanks be to glass beach. After struggling for an hour to put pulls on a some nylon coil zipper by the foot, I found this . It was the plier trick (plus the tape - I used duct tape) that did it for me and took only 3 tries. 6 more zippers to go. This just saved my project!! Thanks! This worked for me! Again, after an hour or so of struggling. Thank you! OMG - I did it! Thank you! Thank you! After fighting for hours trying to put a zipper together I finally decided to look online, found your post, and within two minutes the job is done! Thank you! Thanks so much! I made a big mistake with the make-a-zipper roll and cut off all the zipper pulls with my first zipper. I thought I'd have to throw away the rest of the zipper roll, but you came to the rescue and saved me! Your tutorial was so easy to follow. Thanks so much for the tip. I didn't realise that you can buy rolls of zippers!!! Cool. Thank you so much for the information. I didn't realise that one could purchase rolls of zip! Thank you so much for this - I was trying to thread my by-the-yard zippers from the top down and it was NOT working! This worked a charm! Thank you. I have been trying to figure out how to do this. Followed your tutorial and it worked great. I wonder though how different and more difficult it would be with the two sides separated and not knowing which way is which. Does it matter? The tape is an excellent tip. I always struggle getting the slider started without much to hold onto. Thanks so much for sharing that. Thank you. I struggled for half an hour before reading your post. It worked first time on a continuous plastic zipper. No pliers just a gentle pull. Now I can shorten some extra long zippers that are too long for what I need! Thank you! I also use this method but on zips with a stopper. If it breaks. Snip the stoppers off between stopper and zip teeth. Follow the instructions as stated in the original post, then once lined back up- over sew the area where the stopper was , several times so that the zip cannot go down that far again. Works really well. Same applies to zips that come off at the top. 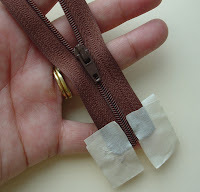 I have also used this method on a metal zip and it also worked well.